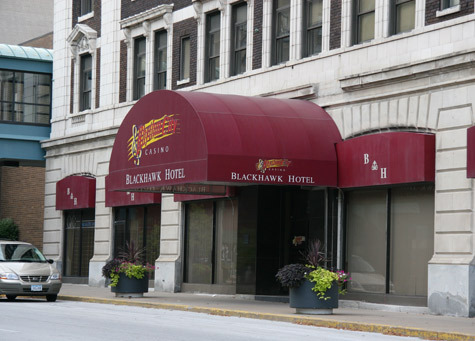 Is the Blackhawk Hotel in Davenport, Iowa haunted? The Blackhawk Hotel occupies one of the oldest continuously operating hotel sites in the country. The hotel was built in 1853 and was first known as the Windsor house, and started out as a wooden frame “stage coach” hotel just one-half block from the town’s first mill on the Cedar River. The building has changed names several times until the late 1870’s, when it was destroyed by fire and was replaced by the four-story, “ Second Empire ” that stands today and was renamed the Davis House. In 1914 the building was renamed again to the Blackhawk and was put on the National Historic Register of Historic Places. The building still functions as a hotel to this day. There are only a small number of ghosts who haunt the building, reports include a pleasant female entity, dressed in a red or blue evening dress and attire to match, who has been seen floating contently down the halls of the hotel. Also the entity of a musician who used to perform solo or with a band haunts the ballroom. It is thought he often plays the piano, as piano music has been heard coming from the ballroom, when no one living was there. The most famous ghost at the hotel is that of a well dressed man who has been seen by witnesses going about his business in the hotel, Some say it is Cary Grant, the famous actor who died on the eight floor of the building from an illness.